There has been a higher than usual number of public stories in the past weeks, between the Uritrottoirs in Paris, the launch of the Use Our Loos campaign in the UK and the BBC’s big freedom of information request. This has sparked (as it always does) a number of off-shoots which I have followed with interest. In my news round-up the other day I came across this piece by 52 year old Katie Rice entitled "Public Toilets are Just Not Good Enough." The farther I read the more frustrated I became and felt compelled to respond to it… largely because it embodies everything I feel is backwards about current conversations on public toilet provision and because Katie Rice is not alone in these attitudes. Advance warning, this post is a bit of a personal rant. 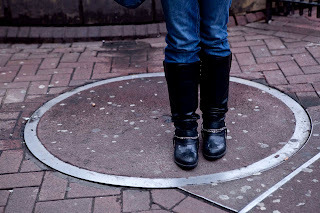 She lists the standard toilet closures that we have heard so many times, but the piece quickly descends into a Victorian cis-feminist rant, more a self-indulgent lament than a suggestion for any possible progress. Below are some of the more mis-guided and offensive statements, and my responses. 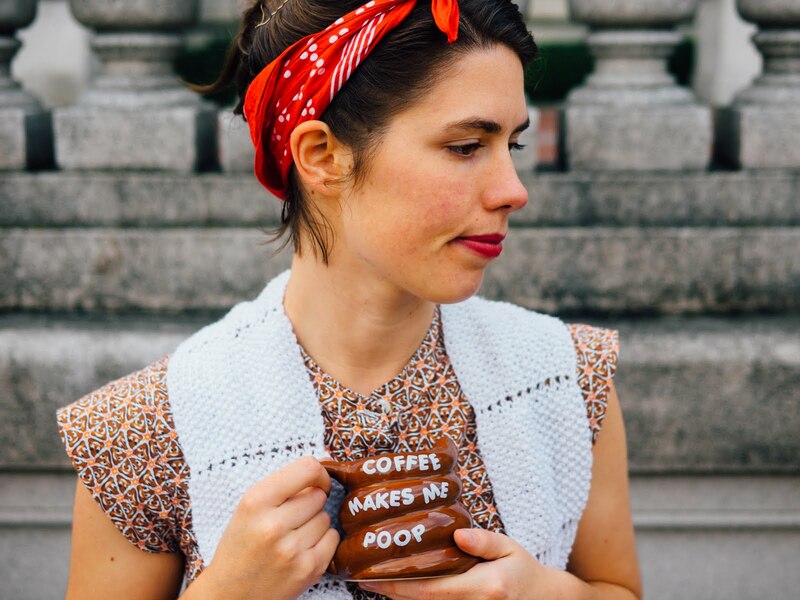 The equation of “being able to hold it” with “being civilized” taps right into the stigma and shame we place on bodily functions, from pee to periods to perspiration. “Civilized” people control their bodies and don’t admit to producing odors or substances. Has she heard of the She-wee? It's literally a handy little gadget which allows women (or people who are not otherwise naturally anatomically equipped) to pee standing up. But that's a minor point... plus they are better suited to hiking than urban adventures. Aaaagh! What would otherwise be a sensible commentary on the amount of time it takes gets obscured by the perpetuation of toilet-seat germaphobia... the idea that the toilet seat is the grossest thing in the room. I am all for cleanliness and hand-washing and good hygiene, but the list of things that has more germs than a toilet seat could fill volumes. Among the things on that list: the flush button, the door handle, the taps on the sink, and the hand dryer. So unless the toilet seat is literally covered in poo chances are you're not going to come into contact with anything on there that you would touch else-where in the loo. Okay. Firstly there is, as far as I am aware (and I have looked), no research stating that gender neutral facilities are less safe. 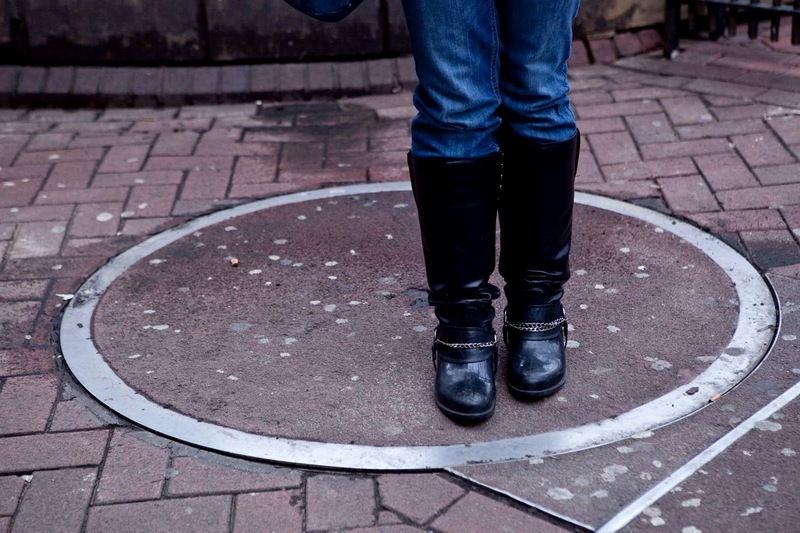 In fact, the limited case studies available tend to point to gender neutral facilities having a lower rate of crime than segregated ones and that in fact because they have higher footfall they tend to be safer. Secondly the argument that cis-women form a “far greater proportion of the population” is or should be irrelevant when weighing the relative safety concerns. Because there most definitely is plenty of documented evidence of trans people facing bathroom discrimination and violence. This attitude infuriates me, but it is very prevalent. I have had multiple conversations in the past month with women over 50 who are heavily involved in the world of public toilets who, as one put it "Don't see why the majority of us should be inconvenienced because of a small minority." By which she essentially meant she would rather see an already marginalized group of the population be further excluded from society than give up the personal comfort of the gender segregated loos she has known all her life. Only half a century ago in the US people were making the same arguments for racial segregation in toilets... and their arguments didn't sound all that different from the ones for gender segregation you hear today. This is straying dangerously into the “boys are gross and have cooties” territory, which is really best left behind in kindergarten (or better yet, never introduced into our consciousness in the first place… side tangent: where does this idea come from?) Women wee all over the seat too... especially when they buy into the previously mentioned germophobia and insist on hovering above it. "What it all comes back to is a lack of public facilities particularly for women. Women have long complained about this problem but they are not being listened to. I don’t think women are being consulted when new buildings are being designed or about existing public toilets. And I don’t think we are making enough noise about it." In and of itself I can't fault any of these statements. Yes, there is a lack of facilities. And toilet design in a field historically dominated by heterosexual cis-gended men, and therefore the facilities are designed with their bodies and comfort in mind. So by all means let's make noise about it! But lets do it in a way that looks forward rather than drags us backwards. The more I get involved in this world of toilet campaigners the more it strikes me how many conversations about publicly available toilets look backwards instead of forwards. Campaigners arguing for Victorian ideals of a discreet private room, segregated by a comfortable gender binary. And I'm unsatisfied with my own response because I don't know what all the answers are. But whatever they are I think they have to do with much wider questions than public toilets. Because these places don't exist in isolation. They are a reflection, perhaps even an amplification of, our cultural beliefs about bodies, gender, class, morality and propriety. It's International Day of the Girl, which seemed like as good an excuse as any to catch up on some stories and news. I don't generally consider myself to be a militant feminist, but more and more these days as I read stories and look at history of gender disparities in toilet provision I find myself climbing up on a metaphorical soap-box, and crying foul. Author's note: It should of course be acknowledged that this issue goes far beyond the gender binary. I have used the terms "men" and "women" throughout most of this piece partly because that is how much of the historical literature and current press divides the matter, but there are, of course, women with penises, men with vaginas, and people who defy any of these prescriptive lables. Perhaps a more accurate division would have been to write about people with external and internal plumbing... but even this didn't seem quite right, as public urinals tend to be for the benefit of (and safest for) cis-gender hetero males... hence I have stuck with slightly clunky outdated terms. I welcome comments on how to do better at integrating inclusive language! There is now a facebook page and a women's movement urging women to take photos of themselves in urinals and show the impracticality of their use. City planners and officials will (as the Amsterdam judge did) argue the impracticality and expense of such accommodation. The fact remains that women's anatomy is seen as problematic, and more complicated to deal with. Women's toilets have been described variously as "objectionable on the score of delicacy" "an abomination" and "an unnecessary expense." This toilet debate puts me in mind of the social and medical models of disability. The medical model says that it is the person who is broken and needs to be fixed- whether because they can't climb stairs or hear or deal with overstimulation. It looks for ways to help them conform to social expectations, and expects them to adapt. The social model meanwhile argues that disability is to a large extent created by these imposed societal norms, and takes the more holistic idea that society can adapt through inclusive design and different approaches. The field of toilet design has historically been dominated by men. It seeps across our culture in subtle ways. My favorite example: why do jeans (generally considered to be gender neutral clothing) have a zip closure at the front, if not to allow men to urinate with greater ease? Skeptical that this is the case? Look at the fact that cultures which prefer squatting over sitting tend to favor robes for both genders. These things may have been obscured by the world of fashion, but I firmly believe that the origins of our aesthetic preferences are at least to some extent rooted in the basic functionality of allowing us to relieve ourselves in the most practical manner. The solution may not yet be obvious, and there is unlikely to be a gender-wide consensus on the best way to approach the issue. 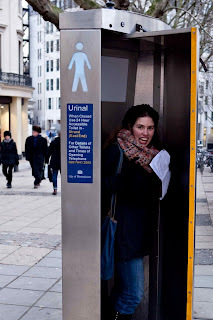 Some women will merrily use a she-wee, or a women's urinal, while others see them as degrading or just uncomfortable (which in turn, it could be argued, is a product of our social conventions and ideas of propriety.) There will never be a one-size-fits-all solution. Right now I think the best we can hope for is to start the conversations. We may not have the answers, but by airing the issues in public we can get more people thinking about what the alternatives might be. Many people (men and women) haven't thought about it simply because our approach is so ingrained that it hadn't occurred to them there was anything to think about. Do you have a story on the subject, a favorite solution, or an idea that hasn't even been mentioned yet? Do share in the comments! 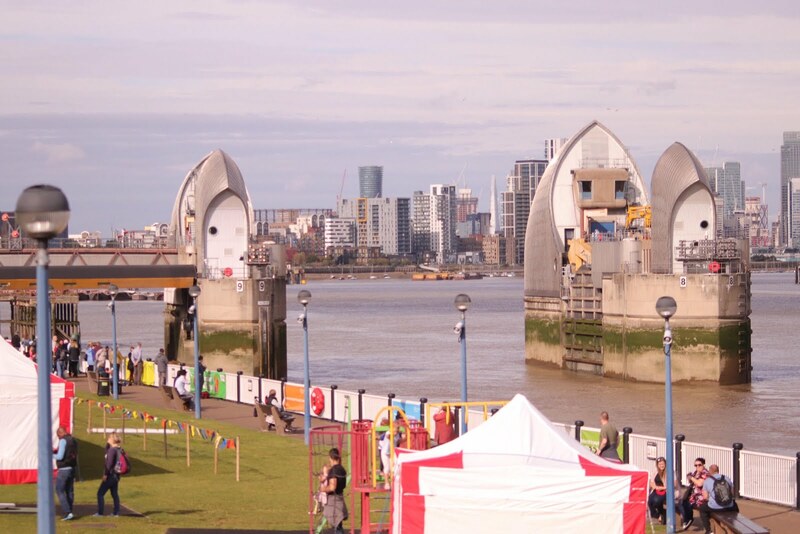 Today was the annual closure of the Thames Barrier. One of the largest flood barriers in the world, it has protected London from Storm surges and unusually high tides since 1984. It is raised once a month for testing, but a scheduled full closure only happens once a year and is a rather special occasion. We arrived on the South Bank near Greenwich around 9 in the morning when it was quiet, save for lots of Environment Agency staff bustling about and setting up. We set up a picnic on the grass and waited. By the time things got started an hour later the road was lined with people who had come out to watch. The barriers have closed 176 times for flood defense (an average of about 5 or 6 times a year) in addition to their routine closures. But it is not intended to last forever... eventually due to climate change and sea level rise the gates will no longer offer complete protection. "The plan is based on contemporary understanding of predicted climate change, but is designed to be adaptable to changes in predictions (including for sea level rise) throughout the century." It was interesting to reflect that I have never lived in a place where I was very aware of environmental threats or imagined the Thames as anything other than a beautiful river (with an interesting history of sewage). Until today, as far as I knew Thames Barrier was "that thing that looks a bit like the Sydney Opera House, that you can take a boat to." It's amazing to think about the infrastructure that is in place, and the careful research, thought and engineering that goes into it, without the average person being aware... and that one day changes, no matter how prepared and planned for, will probably take us by surprise anyway. I'm grateful there are people who devote their careers to the subject in so many ways from protecting the environment from harmful chemicals and plastics to tackling the engineering challenges to ensure that when changes do come we are prepared. There were loads of great organizations out recruiting today, and I now have a whole stack of bedtime reading for tonight! World Toilet Day: What is it? And how to celebrate! Every year World Toilet Day sneaks up on us. While we're already hanging out Christmas decorations in September many people forget there are some very important observances that come first, and this is one of them. It's understandable... World Toilet Day is a fairly young holiday, started in 2001 at the first meeting of the World Toilet Association and only recognized by the UN in 2013. So most people don't know about it until it's happening or has passed, and then they only get the hallmark version of it: The humour without the substance. Wish people a Happy World Toilet Day! When they ask why be prepared to tell them a little about the day and its history. It's a baby step, but you never know where simply getting a person thinking about a topic will lead! Throw a World Day Party! Whether you use it as an opportunity to raise money for a cause or just to reflect on the topic and talk to people about it it's a fun way to acknowledge the day. Topical (but not overly gross) foods include these super adorable Poo Emoji Meringues and lemonade... or rainbow ice cream in honor of the Squatty Potty unicorn. Create a toilet themed Quiz or play. Donate to a cause! There are many options both local in international, so find out what speaks to your interests. It might be one of the big global charities like WaterAid or something local to you. Get a group of friends together to Twin a Toilet! Do something fun and toilet related! 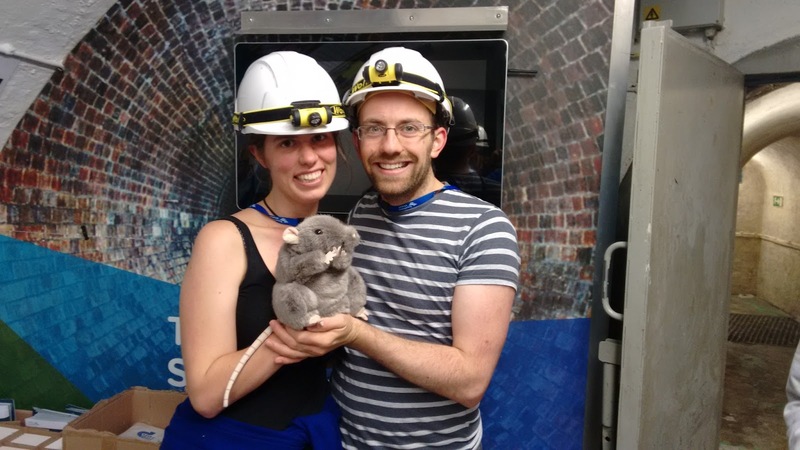 I'm personally biased towards the London Loo Tour, but wherever you are there is likely to be something happening: visit the Paris Sewers or the Manchester Museum of Science (which has a great sewer exhibition). Share your celebrations! For the tweeters among you, previous years hashtags have included #wecantwait #worldtoiletday and #giveashit ... keep an eye out for others relating to your activities of choice! Last year I looked forward with great anticipation to the Brighton Sewer tour, which had been on my bucket-list almost since I started out on my journey of toilet obsession. But alas, a month before the tour was to take place I got an e-mail saying all tours for the year had been canceled due to flooding. Determined to have a sewage adventure of some sort I searched and found the Paris Sewer Museum. I put out an open call to my facebook friends, and found a partner in crime, undeterred by the thought of a weekend of sewage, toilet hunting and eating snails. Despite my having a horrible hacking cough the whole time (arguably the authentic bohemian experience?) that trip turned out to be one of the best things that has ever happened to me. I am now engaged to my patient, long suffering travel companion... and he even proposed with a sewer rat puppet. 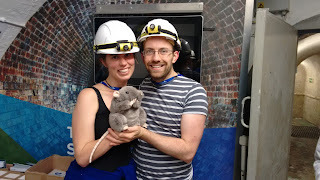 Six months after getting engaged my fiancé and I finally managed to go down those Brighton Sewers, which are at least partially to thank for bringing us together. So with nearly three years of anticipation riding on them those sewers had a lot to live up to! They did not disappoint. Our tour began at 9:30 and we waited on the wall outside the entrance with a group of other sewer enthusiasts. Mostly couples, a few families and a few lone travelers. We had a full group of 25, which is the maximum they take. As we entered were issued with hard hats and rubber gloves and taken into a small room for an introduction. 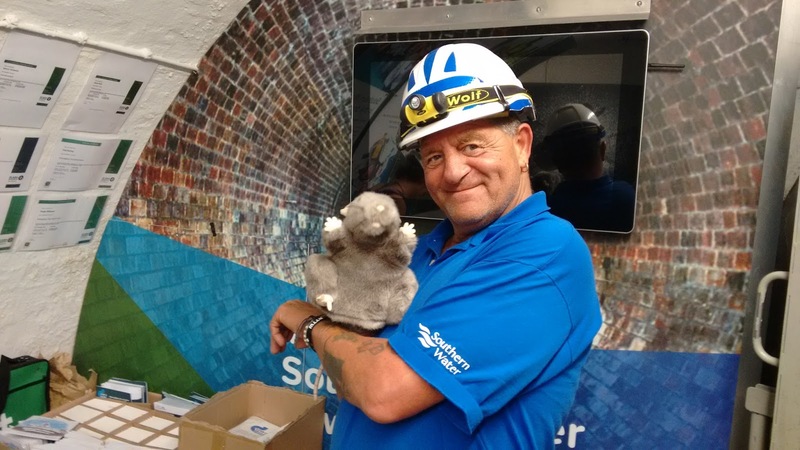 Four guides, all of whom have worked the sewers for many years took it in turns to give us health and safety and a bit of history. The story parallels that of most large cities in the UK: Brighton's sewers were built in the 1860's in response to population growth and exciting diseases like cholera. Improvements have been made since then, but much of it is still the Victorian system. Until fairly recently parts of the sewers were tidal... that is when there was not enough water from the household waste to keep things moving gates could be opened twice a day to let in the high tide and flush out the chambers. You can still see barnacles on the walls. When they are flowing they flow fast! One tunnel we were taken to see moved at about 30 miles per hour... fast enough to knock you over if you stand in it (not recommended.) If you are standing in sewage and feel yourself going down the first thing you should do is close your mouth. As our guide put it, "You've established you're going for a swim... you don't need to drink it as well." Sewer men generally work between 2am and 6am as the safest time to go down is while everybody else is asleep (it used to be midnight and 4am, but night clubs have shifted that.) They clean out grit and grease that block up the sewers. Most of them remember when cleaning grit had an added bonus in the form of coins, rings, gold teeth, pocket watches and other treasures that made their way into the sewers. But these days instead of shoveling grit by hand they pump it into a truck. We walked through the large overflow tunnel and climbed a ladder to emerge in a park a few blocks away from where we began. I wonder if people thought it was strange to see an army of people emerging from the sewers, or if by now the locals are used to it. We hiked back to the start of the tour to wash our hands, collect our backs and receive goodies and pamphlets. Most of the gifts and indeed much had to do with keeping drains clean. As one guide explained it, the drains coming out of your home are usually only 4 inches thick... so if you let grease start piling up it doesn't take long to obstruct them. Actually most of the point of the tour seemed to be not to indulge curious lovebirds with a sanitation fixation, but to spread the gospel of clean drains. A worthy cause indeed! I suppose the only appropriate way to end this post is to say that I hope that my marriage will be as enduring and the sewers. That we will treat our relationship with care and respect and not dump grease, wet wipes, ear cleaners or dead goldfish on it (metaphorically or literally.) That though there may be grit to clean from time to time, we may find the gold and false teeth to make it worthwhile. I don't often manage to offend people, so it was interesting to re-post something I thought was reasonably innocent on Facebook and receive some fairly strong reactions to it. Perhaps these things are inappropriately combined in some people's eyes. 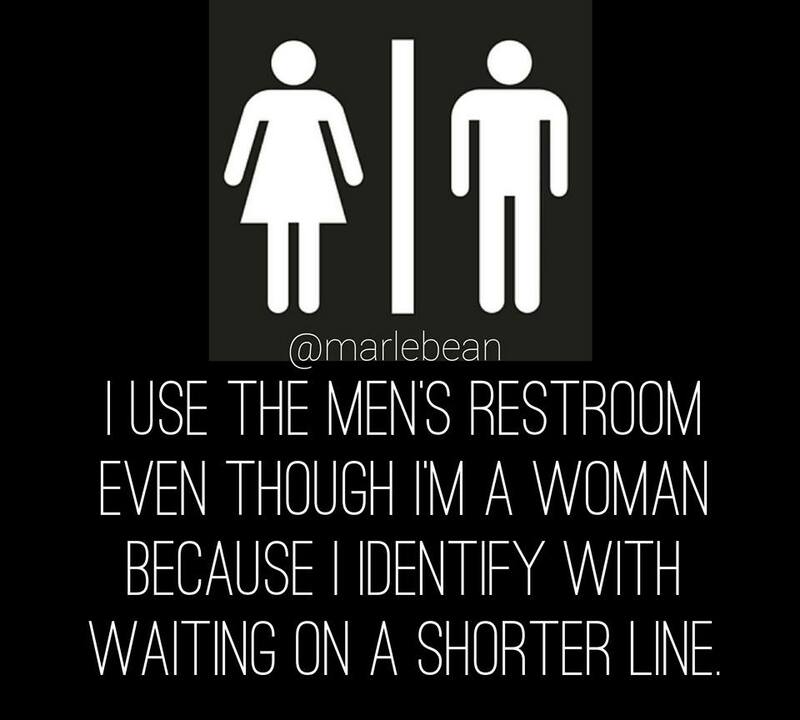 I would have to agree that my annoyance at having to wait in ladies' queues pales in comparison to the risk that a trans person takes using a public rest room. It's not unlike the way my frustration at having to pay for (or worse, not being able to find) public toilets seems negligible compared to the plight of the billions worldwide who have no access at all. But that doesn't mean we don't or shouldn't talk about all the issues... and much of my toilet-ing work has been built on the idea that a) sometimes looking at multiple things at once leads to stronger and more creative solutions and b) finding the humour in a potentially uncomfortable situation can make it easier to talk about. "It's really too soon to make jokes about things like this." "People are getting killed by the right wing-extremists. Stop it with the jokes." My first reaction was defensive: that I didn't see it as a joke. So I had to interrogate: If it's not a joke, what is it? A tongue in cheek statement of fact. Okay- so maybe it is a joke, but one that pokes fun at my own reality rather than being intended to demean anyone else's struggle. On closer reflection though it strikes me that offending language is probably the potential implication that people identify as something else are still 'actually' their biological gender (which, horror of horrors makes it not much better than Mike Huckabee joking "I wish that someone told me that when I was in high school that I could have 'felt like a woman' when it came time to take showers in PE.") I see it now, unintentional though it might have been. In the end I took the post down, not because I don't still think it's interesting nor because I don't find a grain of amusing truth in it, but because if a picture is worth a thousand words this one is not very clear about what those words are and too open to misinterpretation without context. I think there is a more productive discussion to be had around the issue, and I'm grateful for a circle of acquaintances who can call it out when communication is not effective. So here are some thoughts and questions off the back of that. It has been written time and time again that toilets are, if not the last, then at least one of the most visible sites of gender segregation. A binary system that not only favours men over women in terms of provision, but forces a person to publicly declare "I am 'this' or 'that'"and then opens them up to the judgement of society if they do not fit neatly into the prescribed order. I am generally for de-gendering toilets all together, though I know this in itself is a tricky issue, easier said than done. But it seems to me that in addition to the practicalities of equitable queuing and fluid gender roles (like tradition of providing baby change tables only in the ladies) it provides a more fluid view of gender identity, taking away the need to make a political statement through a simple bodily function. There will always be contexts where, for whatever reason, separate facilities are necessary, but what if these were to become the exception rather than the rule? 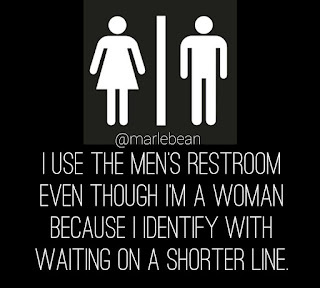 It occurs to me is probably safer for me as a cis-gendered woman to use the men's toilet in many places than it is for a transgender man. I have used men's toilets when the ladies was being cleaned, when the line was long, and when I just wanted to see what the inside was like as part of my research. I have occasionally been told off, but never have I felt endangered. It's not an experience I can easily imagine, nor one I would wish on anyone. I'd be interested to hear feedback from my friends (of all orientations.) What can be done to make restrooms a safe and stress-free experience? What needs to be done (and is already happening) in terms of larger social change? And what can friends and allies do on a practical day to day level? And, if you are willing to share, what particularly good or bad experiences have you had? Last night I took the GRE... a requirement for most American Graduate Programmes. On arriving at the testing centre I copied out a statement that I would not disclose the contents of the test to any other person by any means. So this post will, of course, only touch on the things that took place outside of the testing room. But that is where the real drama takes place. There are plenty of wonderfully helpful aids to prepare you for the test itself, but very little to inform you about the accompanying rituals, so here, based on my experience is a guide on what to expect on test day. Once non-disclosure forms are signed, your mobile phone turned off and your belongings stowed securely in a locker, you will be taken into an anti-room. Here you will be given a once-over with a metal detection wand, asked to roll up your sleeves to the elbows, turn out all your pockets, and show your ankles. That done you sit in a chair to get your mugshot taken, and sign into the sacred testing room. If your signature isn't legible enough for their taste you will be asked to redo it. Protestations that it is good enough for your bank and your credit card company are of no use. So you print it more painstakingly than you probably have since third grade. You are now ready to enter the facility and be guided to your computer station where you will take the test. Once inside the facility you may not put on or remove any items of clothing. Should you decide that you are too warm you must exit the testing room, sign out (make your signature match the one from when you signed in!) get permission to open your locker to put away the sweater, and go through the whole process of metal detecting, ankle displays and turning out your pockets again. All while the test clock is still running. You get one scheduled pee break in the 5 hour test, during which you go through the same security checks. You may take additional breaks with the clock running, but you are warned that if you take a suspicious number of breaks this will be reported by the centre staff to the powers that be. As you leave you get your only consolation of retaliation is to sign your name with the minimal possible amount of legibility, and take a handful of the free mints on the receptionists desk. And that is the GRE. The great irony is that GRE scores are of secondary importance to most schools. They are far more interested in the person you are and the things that you will bring to the programme which can't be measured by your ability to ace a generic test. Really, if a student is innovative enough to develop a test support tool that can be smuggled past the guards and activated by the simple removal of a sweater any grad school ought to welcome them with open arms! As I final confession, I did actually, in a weird way, quite enjoy taking the test. There's something satisfying about having completed it, and now I'm one step closer to graduate school, with an over priced piece of paper to prove in some quantifiable way that I am smart. Sure, on the way home I may have got on completely the wrong freeway exit and then spent 5 minutes waiting for the tea kettle to boil before I realised I hadn't turned the burner on. But hey! At least I know how to -REDACTED BECAUSE I CAN'T DISCUSS TEST QUESTIONS.